Veteran journalist Ed Herbst catalogues the instances of fake news coming out of the once venerable journal, The Cape Times, since Aneez Salie was appointed editor three years ago. This, of course, follows a pattern of journalistic outrages since Iqbal Surve acquired ownership of the newspaper, as Herbst reports in Biznews.com. Take a look for yourself. Little more than a month ago, on 27 January, the Cape Times front page lead attributed to Cape Town’s mayor, Patricia de Lille, an accusation that ‘Informal settlements are the main culprits’ in water wastage during a water shortage crisis and that statement formed part of the headline. This was Fake News by a newspaper that has specialised in Fake News ever since the owner the Independent Media company, Dr Iqbal Survé, appointed Aneez Salie as editor three years ago. Mayor de Lille said no such thing – that headline was devoid of truth. A request from the Cape Town municipality that a correction of equal prominence be published was denied by Salie and, three days later, he directed that a five-sentence correction be unobtrusively placed in the bottom left corner of page three. Now, little more than a month later the Cape Times, the Indy’s answer to the New Age, has just produced another Fake News front page article – attacking another senior Democratic Alliance politician in the city – Western Cape Premier Helen Zille. The article was headlined – Most murderers not white. Nothing like this happened at the Cape Times during the apartheid era when it was a respected institution which had respected editors like Tony Heard at the helm. Showing contempt for the intelligence of its dwindling group of readers, the newspaper then counter-attacked in a late night retreat, denying the existence of a smear campaign against Zille and seeking to deflect blame by accusing her of being someone who seeks to manipulate the news through intimidation and making false accusations against the media. The woman who, as a reporter on the Rand Daily Mail, took immense risks to expose the fact that Steve Biko was murdered by the apartheid regime? This from a newspaper that has attacked Zille in an article with a headline accusing her of being a ‘white madam’ and whose senior executives use the same ethnically-inflammatory epithet on social media? This from a newspaper which was forced to apologise by the SA Press Council – which it has since left to evade accountability – because, for months on end last year, it waged a brazen and unashamed vendetta of falsehoods against Zille claiming that she had hired a policeman, Paul Scheepers, to spy for her? Predictably, the ANC used these Cape Times fabrications as a basis for laying charges against Zille while, bizarrely, seeking her impeachment. Unsurprisingly, the ANC was given maximum publicity in the Cape Times for so doing. The newspaper now claims that the latest gaffe was a mistake but, given the fact that its senior sub-editing staff have been purged, this was an accident waiting to happen. Let it not be forgotten that while the Cape Times once had news editors and journalists like Alide Dasnois, Janet Heard and Tony Weaver who were capable of producing a Madiba obituary that Time magazine rated as one of the best in the world, that edition was put together by a stellar team of immensely experienced and talented subeditors – people like Glen Bownes, Ethne Zinn and Dan Simon. Nothing like the abuses now occurring at a once-trusted newspaper, occurred on their watch. They are all gone now. Simon’s dismissal, like so many others, was found to be un-procedural by the CCMA last year. This has to be seen in the broader context of an openly-proclaimed vendetta against white Indy staff, particularly white Cape Times staff, which began with the Sekunjalo takeover. The vendetta started on 9 December 2013 when Iqbal Survé’s lawyers wrote a threatening letter to one of the country’s leading environmental reporters, Melanie Gosling, because of her absolutely factual summary of Thuli Madonsela’s December 2013 report, Docked Vessels on the dodgy Sekunjalo tender. 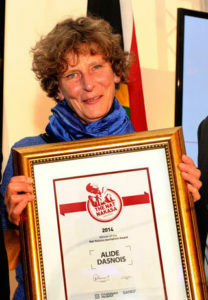 This legal intimidation by a newspaper owner against his own staff was without precedent in South African media history and, after experiencing two years of subsequent and consequent victimisation Gosling, an award-winning environmental reporter with decades of loyal service to the Cape Times, asked for early retirement. In late January the following year, Iqbal Surve’s senior news executives Karima Brown and Vukani Mde (who were later to attend an ANC rally in party colours) launched a pre-emptive and ultimately successful strike – if the dearth of white staff at the Cape Times is anything to go by – against the Indy’s leading white journalists and columnists. ‘A small but very privileged and racially definable minority still controls the tools of public discourse, including the bulk of private commercial media and virtually all the mainstream newspaper groups. ‘This group has resisted and fought against transformation of the media, be it in ownership, management, or in newsrooms. They’ve grown adept at paying lip service to the goals of transformation and media diversity, but in truth remain against them, as their joint and individual actions demonstrate’. So defamatory was the Brown/Mde article that some newspapers in the group decided not to publish it and some versions that were published had the defamatory elements edited out. The article includes the promise of an editorial charter – which has never, to this day, appeared – just more Fake News. They claim that this will be the first such charter in the country, apparently unaware that Ari Rossouw, then editor of Die Burger, had revealed his newspaper’s new editorial charter almost a decade earlier at the Cape Town Press Club on 25 October 2005. The article also mentions an ‘editorial advisory board’ of which nothing more has been heard and which must be inoperative given the dozens of complaints that have been laid with the Press Council against Indy newspapers since that time. The then editor of the Cape Times and now Western Cape regional executive editor, Gasant Abarder, followed up by dismissing white and coloured columnists including the beloved John Scott, in two line emails. Heinously he refused to publish a letter from Scott explaining why he was no longer writing for the newspaper, so Scott’s letter was published in Afrikaans in Die Burger. Within hours it had been translated into English and published on Facebook. For further information on this topic, read Sydney Kaye’s article on Politicsweb and the comments below it. A prominent characteristic of this campaign was the sudden advent of the word ‘lashed’ in Cape Time headlines – but, strangely enough, it is never the ANC that is the victim of this lashing. 5 March 2015 – An article Foetal alcohol syndrome’s sad legacy which claims that the tot system is still pervasive on Western Cape wine farms is not only devoid of truth but is exposed by Helen Zille as having been plagiarised. The reporter leaves but Aneez Salie stays put – the buck, most emphatically, does not stop with him. 24 July 2015 – In a front page article in the Cape Times headlined RMF activist’s charges dropped, reporter Carlo Petersen writes: ‘An act of bad faith by UCT vice-chancellor Max Price resulted in a criminal case against a Rhodes Must Fall (RMF) activist being withdrawn, the activist’s attorney said.’ This is a brazen fabrication by Petersen who falsely attributes this quote to attorney Peter Williams. Williams then, in a subsequent letter to the newspaper, emphatically denies ever making such a statement. After this, Iqbal Survé promotes Carlo Petersen from reporter to assistant editor at the newspaper. 25 November 2015 – The Cape Times front page lead, headlined Zille’s spook ‘had grabber’ – spokesperson reticent on issue is devoid of truth and the Press Council’s Appeals Panel orders the Cape Times to apologise for and retract the statement about ‘Zille’s Spook’. 9 May 2016 – The Cape Times attempts to mislead its readers with a front page lead headlined Independent vindicated in Dasnois settlement and is ordered by the Press Council to apologise. 14 September 2016 – A Cape Times editorial, presumably written by Aneez Salie, attributes to Judge Siraj Desai a remark that he had been ridiculed by the Democratic Alliance about his ‘Garnishee order’ ruling. The statement is devoid of truth and on-the-record evidence indicates that, to the contrary, the DA lavished praise on the judgement. 27 January 2017 – The Cape Times front page lead, in an attempt to demonise the Democratic Alliance, attributes to Cape Town mayor Patricia de Lille a claim she never made – that the biggest water wasters during a water shortage crisis were the poorest of the poor in the city’s informal settlements. 3 March 2017 – The Cape Times front page lead deletes words from a speech by Premier Helen Zille and then prints a belated apology in its next issue cheek by jowl with an article attacking Zille as someone who attempts to ‘bully and intimidate’ the media and referring to a ‘non-existent smear campaign’. Sales of the Cape Times have declined month-on-month since Salie was made editor which is ironic because falling circulation was a factor which Survé previously used to justify the dismissal of Alide Dasnois (pictured left). So recklessly dishonest has the conduct of the Indy titles become since Iqbal Survé took control three years ago that, as the SA Press Council pointed out, it was adjudicating on 77 complaints when, following the lead of the Gupta’s New Age newspaper, Sekunjalo threw in the towel and removed itself from Press Council oversight rather than have to publish yet more humiliating apologies about the routinely-dishonest reporting of its newspapers like the Cape Times. It then appointed its own internal ombudsman, Jovial Rantao, editor of the Sunday Tribune. So what chance people have people like Chad de Matos who, innocent of any crime, saw his reputation trashed week after week after week, month after a month in the Cape Times, who was repeatedly excoriated in letters to the newspaper and saw himself branded on social media as ‘racist white trash’ and ended up in Pollsmoor Prison – because he was a white UCT student – of getting a fair hearing from Rantao should they take complaints to him for adjudication? Very little if this account by Don Abbot is anything to go by. When will Sanef, allegedly committed to the promotion of ethical journalism, break its complicit silence about the way in which media power and influence are being abused at INMSA to pursue political objectives and to ratchet up ethnic tension?